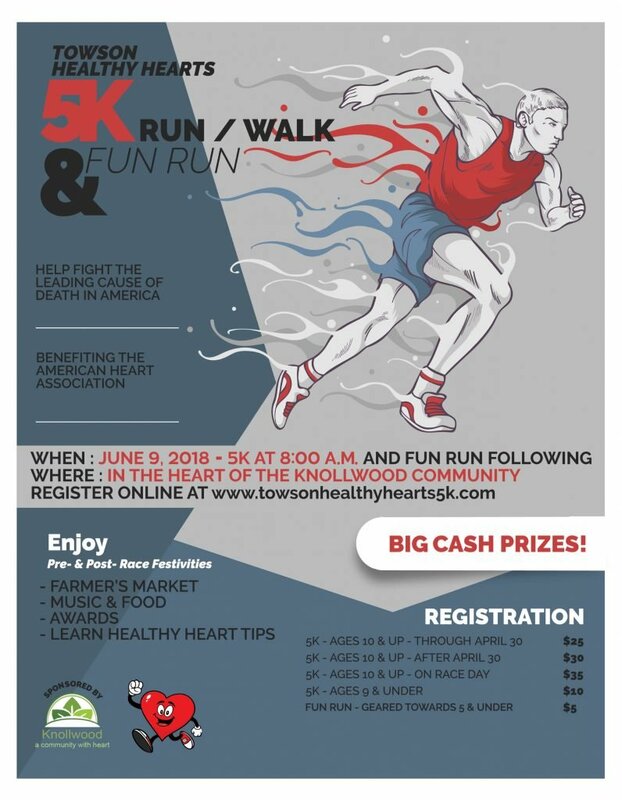 The Knollwood community in Towson is sponsoring its annual 5K run/walk, Towson Healthy Hearts 5K, and post-race farmer’s market, as part of its efforts to raise awareness for healthy lifestyles. All net proceeds from this event will be donated to the American Heart Association. There will be cash prizes for the top three overall winners, both male and female, for the 5K run/walk. Afterwards, there will be a Kids’ Fun Run. The race takes place at the 7600 Block on Knollwood Rd. in Towson, MD on June 9, 2018 at 8:00 am. The race will occur rain or shine. Enjoy pre- and post-race festivities such as a farmer’s market, music and food, awards, and learn healthy heart tips. The inaugural 2017 race boasted over 200 participants and donated $4,000 to the American Heart Association.